Ten minutes, six goals & two 3-3 draws - how a dramatic week of Euro 2020 qualifiers ended in a fitting finale. Liverpool midfielder Xherdan Shaqiri withdraws from Switzerland's squad for their first two Euro 2020 qualifiers because of a groin injury. 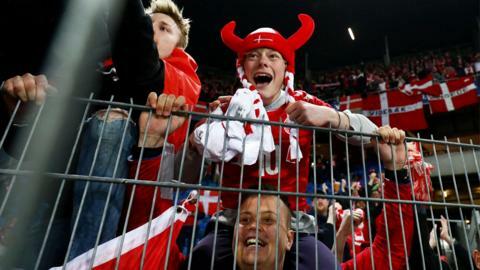 Haris Seferovic scores a hat-trick as Switzerland complete a scarcely believable comeback to thrash Belgium and reach the Nations League finals. Relive the most watched moments from the 2018 World Cup in Russia, including amazing celebrations, player theatrics and goalkeeping howlers. 'That's outrageous!' How was that not a penalty? Read more on 'That's outrageous!' How was that not a penalty? Who is playing? How can you watch? Who will win? Everything you need to know on day 20 of the 2014 Fifa World Cup. Who is playing? How can you watch the games? Who will win? All the information you need on day four of the World Cup.